Paintings line the main public hallway at Albany City Hall. Why no people? It was late at night. I know it seems unlikely, but it’s possible to get bored at city meetings, especially when they take all night. If you’re an observer and not a participant, one way to bridge the slow parts is to step outside and amuse yourself by checking out the art hanging on the walls. 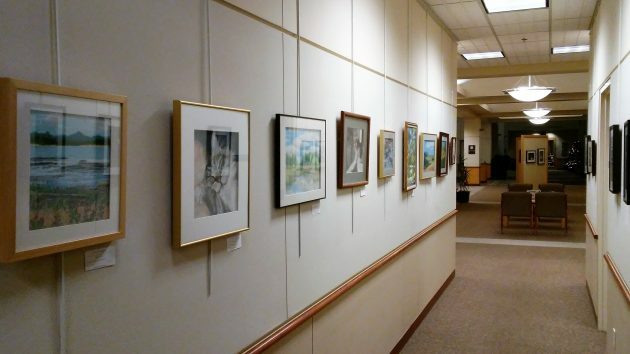 Every month or so, the volunteer Albany Arts Commission arranges for a new collection of works to be displayed in the lobby of City Hall, right outside the council chamber, and down the long hallway that stretches to the Third Avenue door. This month, what you see there are the works of Billie and Michael Moore. In a City Hall announcement a couple of weeks ago, both artists were described as former members of the Arts Commission. The announcement said Michael uses pastel sticks to apply color to various kinds of paper surfaces including sandpaper. You can spot some examples of this in the display. His wife’s oil paintings are inspired by her cats, among other things, and I think I saw at least one of her cat paintings as well. 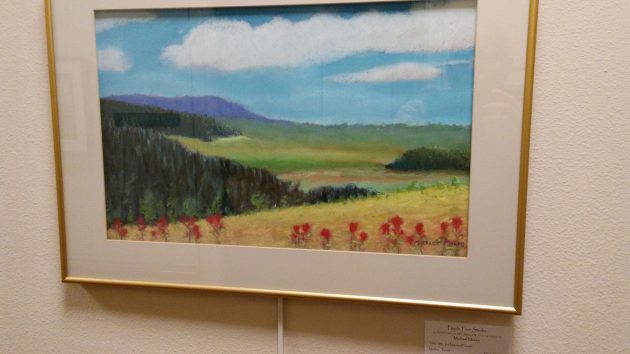 One of Michael Moore’s landscapes on display this month. And if, by happenstance, someone wanders in and wonders “what else” happens at City Hall, who knows? Possibly it will pique their interest to becoming more directly involved. That is always a good thing! A finger nail scraping down a blackboard is a more pleasurable experience than sitting through a city council meeting. As to Michael Moore, the cantankerous old goat who helped re-define art (and golf) in Albany, I have one of his masterpieces hanging in my house. I don’t miss Albany’s political dysfunction, but I do miss some of the souls that made living there an interesting experience. Michael and Billie are on that list.